For the first time anywhere (4) complete Heddon Catalogues made possible only by The Bassman™. 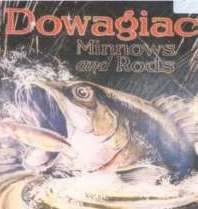 These four years of the Heddon catalogues are the years that Mr. Harbin has not published in his 1977 James Heddon's Sons Catalogues and Heddon Historical Footprints books. 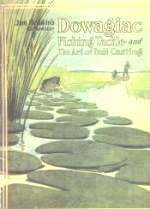 The James Heddon's Sons Catalogues book has (24) catalogs and the Historical Footprints book has (6) catalogs and now along with these "Four Oldies" this is a total of (34) Heddon Catalogues. 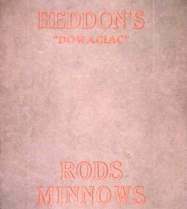 The 1911, 1913 and 1916 Heddon catalogues were made from color slides that were taken in July and August of 1981. The 1914 catalogue were made from larger than letter size prints then reduced to letter size photographs. The photo lights used back in 1981 for these catalogues are not of the quality lighting available today and some of the small prints may not be as clear as the original catalogues. After knowing this information I believe you will be very pleased with the quality of there Four Old and Rare Heddon Catalogues.